The whole school family took part in the project “Workshop of Sustainable Development”. The event is aimed at creating a culture of reasonable consumption of natural resources in order to reduce the amount of waste and save money. The event was organized with the assistance of the Lions Club “Kyiv Ecology”, BETEN International with the support of Syvedac Caen la mer and the Cherkasy City Council. The project took place within the framework of the Days of Sustainable Energy in Cherkasy. 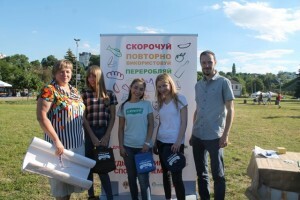 In Cherkasy, ​​9% of all waste is plastic, including 5% – polyethylene packages. These materials are difficult to process and are often unsuitable for reuse. In order to make it easier to explain to residents of the city how to reduce the amount of household waste, alternative workshops were held: lunch boxes instead of polyethylene bags, my bottle instead of thousands of plastic bottles, eco-shopping bags. The attendees had the opportunity to exchange 5 plastic bottles or packages on a stylish eco-bag. Students with great pleasure joined the master classes: “Aquagrim”, “Molding from clay”, “Paper-plastic”, “Origami”, “Making souvenirs”, “Corrugation technique”. With the participation of the representatives of the French company “Betten Enzenieri”, a workshop “Free garden on the window” was held, where they taught them to make pots for flowers made from improvised materials and raw materials. Through eco-games students learned a lot about useful information about waste management.